We are all familiar with the story of Macbeth, the Scottish warlord who would become king partly on the count of the Three Witches. After a victorious battle, Macbeth encounters the Three Witches and upon doing so is told he will be king. Macbeth and his wife then plot to murder Duncan, the current monarch. Under the guise of merriment and despite Macbeth’s reservations, he and his wife welcome Duncan and his kinsmen into their home, get the king’s chamberlains drunk and assassinate the king. Newly crowned, Macbeth descends from sovereign to psychopath murdering his loyal friend Banquo. A second caucus with the Three Witches only heightens Macbeth’s paranoia and prompts him to have the family of Macduff, a fellow kinsman, murdered. Meanwhile, Lady Macbeth, overcome with guilt, plummets into depression and begins to sleepwalk. Eventually she commits suicide. Macbeth is ultimately vanquished by Macduff and Duncan’s eldest son Malcolm becomes king. No matter the interpretation, the theme of the supernatural is constantly present in “Macbeth”. You can’t get away from it, but what makes Shakespeare’s work so genius is that the interpretation of his plays depends on the road you take. Director Jack O’Brien’s offering of “Macbeth” chooses to take the metaphysical path. In this version, the Three Witches aren’t just a trio of wacky soothsayers convening around a cauldron. Oh no. These conniving necromancers morph into other characters on stage, thus taking on the personas of puppet masters ensuring their marionettes move their strings in the exact order they desire. The witches’ almost ubiquitous presence calls into question the subject of fate and action. How much of Macbeth’s destiny relied on his own ambition or that of the Three Witches? Was Macbeth’s belief in the witches’ prediction responsible for all the events that followed? How responsible are Macbeth and Lady Macbeth for their actions if their actions were just pit stops along their destined path? Jack O’Brien’s interpretation of this classic tragedy sets the mind ablaze with questions about the workings of the universe and the individual’s role in it to create good or evil. What I find most intriguing about this production is that O’Brien doesn’t attempt to supply the audience with answers, the answers you must discover for yourself. The visuals of “Macbeth” only intensify the mystical happenings on stage. From the moment the audience takes their seats and views the carved mandala, they become keenly aware of the conjuring set to take place. And just like the actors, we are at the witches’ mercy, forced to watch two lovers plunge headlong into the abyss of destruction. Along with the sacred symbol of the universe, the production is draped in the primary colors of black, white and blood red – hues that have meaning in the occult. The lighting provides a stark perception of the actors making the tragic events more exaggerated and the imagery more daunting. The costumes and sets courtesy of Catherine Zuber and Scott Pask produce a minimalist, sleek quality without dedicating itself to one particular time period. And what of the thespians who resurrect the bubbling and boiling characters full of toil and trouble? Color me impressed. The vernacular of Shakespeare is a language we learn in high school and unless you take courses in it in college, there it stays. If not performed correctly, the rich wording of Shakespeare’s prose can come off like pubescent ramblings of students looking for a mid-term grade. Some reincarnations of Shakespeare’s plays I have witnessed as of late have possessed this puerile quality. Not so with this production. Led by Ethan Hawke, the cast as a whole is more fair than foul. I’ve viewed productions where actors performed Shakespeare as if they were competing for top prize in “Who Can Scream Loudest.” Hawke’s Macbeth is a combination of shrewd underplaying offset by fierce outbursts of emotion. He is the personification of a man slipping into darkness. 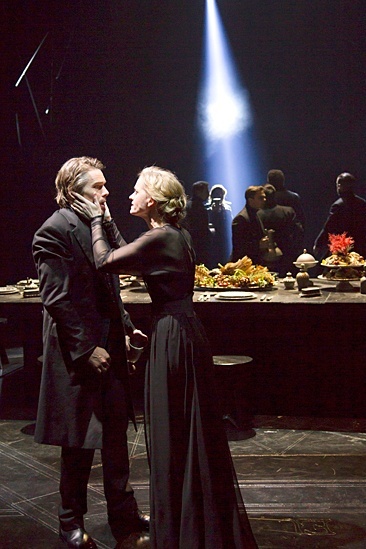 As Lady Macbeth, Anne-Marie Duff is sensational. She embodies the grace of a queen and psyche of a sociopath. Together Hawke and Duff brilliantly represent one word…karma. 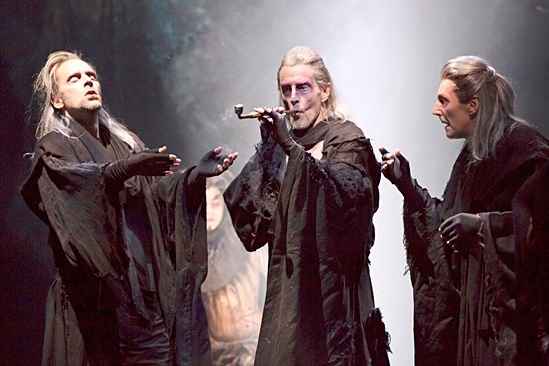 Malcolm Gets, John Glover and Byron Jennings portray the pied pipers of wizardry in this numinous production. Although they look like rejects from “RuPaul’s Drag Race”, the sorcerers don’t just play to win, they play for keeps. The havoc they render adds the spice that makes this supernatural gumbo complete. On a surprising note, I was pleased with Daniel Sunjata’s Macduff. Though a bit heavy handed in his delivery at times, he proved to me that he is more than just a pretty face. What I enjoyed most about the production was its fluidness. It moved like a choreographed dance, constantly adding layers. Christmas hovers in the air, tis the season to be jolly, but for Hawke and company tis the time to be wicked, the naughty reign supreme at The Vivian Beaumont Theater. “Macbeth” has a limited run and ends on January 12. Take a break from tidings of cheer and take a walk down the paranormal path. Without a doubt, this production is worth seeing.